The Manor in Marcinkowo Górne is located in a picturesque area. Sculptures of two warriors of the Piast dynasty holding the heraldic shields adorn the entry gate. The architectural form dates from the first half of the eighteenth century, the Manor complex consists of: a baroque manor, two annexes and a stable. Not far from the Manor, on the edge of the park, there is a monument of Leszek the White who was assassinated by Swietopelk in 1227 during the congress of princes. 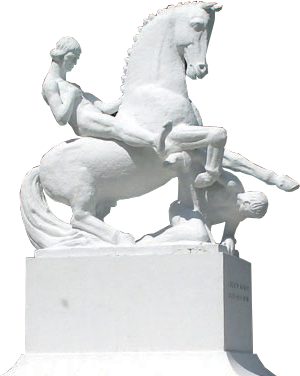 In 1927, on the occasion of the 700th anniversary of Leszek the White’s death, there was a monument erected there depicting the prince just before his death by arrow in his back. Destroyed during the World War II, the monument was restored in 1973 by Rudolf Rogaty. At the end of 2009, the complex was thoroughly renovated. Now we can offer you the highest standards of service in a historic manor. The Manor consists of two main, located in the central part, Mirror Halls, two smaller, side Green Halls, a bar with a design of an eighteenth-century portal of a tiled stove, and a lobby. The side halls can be used as dance floors or conference and training rooms. All rooms can be adapted according to your needs and wishes.